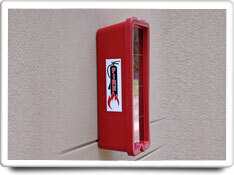 Properly maintained fire extinguishers can be used to contain a small fire thereby keeping damage to a minimum. NOTE: The tasks and timings shown here for your Fire Extinguishers are based on a single-family home (owned), located in Massachusetts, United States, with priority set at ‘1 star' or higher, for all possible goals. If you set your personalization differently in your Home Wizard app, then you may get reminders for different tasks and timings in your recommended home care program for your Fire Extinguishers. Check pressure gauge to ensure a full charge. Check that the nozzle isn't clogged by insects debris, etc. Shake the extinguisher so that chemicals do not become packed. Check that hanger is securely fastened and that everyone knows the location. Make sure all fire extinguishers are accessible and not buried under other items. Note: Do not discharge the extinguisher to test if it is working, as this will empty the unit. The benefits of this task are relatively high. Doing this task helps to ensure that your extinguishers will work properly in a fire emergency.